This is not one the best episodes of Bonkers, but it has moments of amusement. But then again, I liked Bonkers, and plenty of people just plain did not. I get it, it was a farcical comedy for the most part, and it was loosely based on the world of Who Framed Roger Rabbit while being entirely animated. But hey, I thought the show (about a toon who joins the human police force to help them deal with toon crimes) was cute and had promise. I’ll admit this Christmas episode was pretty weak, though. Santa has a malfunction testing a new sleigh, and ends up at Fall-Apart Rabbit’s home with some amnesia. Fall-Apart takes his new friend “Jim” on some unseasonal adventures, which mostly seemed there to kill time with bad jokes. Meanwhile, some elves show up at the police station to enlist their help in tracking down the missing Santa. 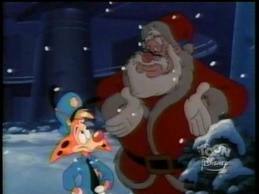 Bonkers takes on the case (though he doesn’t seem to get very far), while the elves try to get his partner, Lucky, to train to be a Santa stand-in in case they don’t find the real holiday figure. There’s a cloying subplot about Lucky’s usually sensible and probably too-old-for-Santa daughter, and a lot of tedious slapstick surrounding the Santa training. Of course everything gets straightened out in the end, but while it isn’t horrible, the journey isn’t really worth your time.